Do we all have a right to feel happy at work? Is it important? And what responsibility should a company take when it comes to our emotional wellbeing in the workplace? Last week I was lucky enough to attend the Enterprising Women Summit at the Institute of Directors. 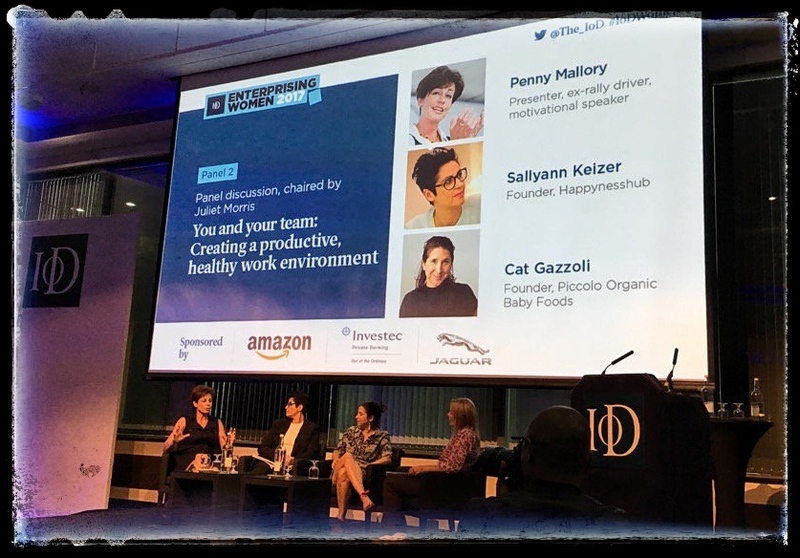 I was speaking on a panel about mental health in the workplace, thinking about how and why business should look after the mental wellbeing of their team. The panel was chaired by the lovely Juliet Morris, journalist and TV presenter. Juliet asked me – is it truly realistic that we can have a happy workforce? Well – no surprises – I said yes! As many of you know, we are launching the Happynesshub@Work programme in the near future, a 10-week offering to work with organisations in supporting their staff emotionally. It’s about workplaces promoting a positive and nurturing culture, and one of openness when it comes to mental health. As I said to Juliet on the panel – I truly believe we should have a working culture that promotes emotionally healthy staff – and the least we should do as responsible employers is prioritise this as a company goal. And even if employers don’t invest in because they feel they have a responsibility to, the good news is that evidence shows happy staff equals greater productivity equals greater profit. According to a 2015 report by the London Business School, organisations with high levels of employee wellbeing, have outperformed the stock market over a 2-5 year period. Whereas not prioritising mental wellbeing costs businesses money. BUPA reported that an estimated 15.2 million sick days per year in the UK are due to stress, anxiety or depression. A few years ago a survey by Mind, the mental health charity, found that over half of the British public would not employ someone experiencing depression, even if they were the best candidate for the job. Given that around 1 in 4 people experience some kind mental health problem each year, this simply does not bode well – let alone the questionable ethics behind this. We have had many years of big companies focusing on employees’ physical health – discounting gym memberships, encouraging healthy eating and the like. But I think and hope the tide is turning and more and more organisations are realising they need to prioritise mental and emotional health. For me, the ideal scenario is for all of us to do everything we can to remove the stigma of mental illness. To ensure that colleagues who are struggling mentally feel they can talk about it and get support. And finally to offer a workplace culture where staff feel safe and secure, nurtured, valued, respected and understood – ideally with purpose and meaning in their jobs. Too idealistic? I don’t think so. It’s surely worth a try.